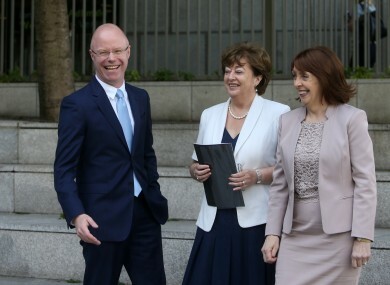 New Political Venture called Social Democrats with L TO Stephen Donnelly with Catherine Murphy and Roisin Shortall. THE LATEST RED C poll for the Sunday Business Post shows that support for independents has risen, taking 31% support. Both Fine Gael and Fianna Fáil see a drop in support, Labour is marginally up and Sinn Féin sees no change. The polls results have Fine Gael at 25% down 3 points, Fianna Fáil at 18% down 2 points and Labour up 1 point to 8%. Sinn Féin came in at 18% – no change. Independents have seen a rise of 4 points. Within the independents grouping, the Greens and the Social Democrats are each on 2%, while both Renua and People Before Profit are at 1%. Last week The Sunday Times/ Behaviour & Attitudes poll also showed independents at 31%. 12% of voters said they were undecided . Email “Independents top the latest poll with 31% support”. Feedback on “Independents top the latest poll with 31% support”.